The X-90 was Suzuki's Sidekick/Escudo based replacement for the outgoing Samurai and it was setup on a longitudinal engine configuration with an optional 4X4 transfer case. It might have looked like just another front wheel drive lifted econobox masquerading as a compact SUV, but it actually has legitimate street offroad cred. 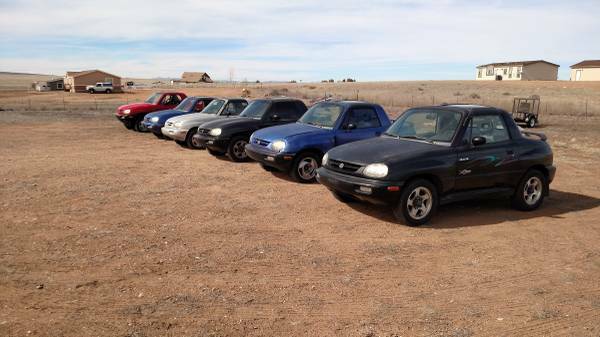 Today's next feature is a cadre of six 1990s Suzuki X-90s offered for $2500 to $6000 each or all for $25,000, located in Denver, CO via craigslist.. Tip from Joel. It's easy to understand how someone ends up with six X-90s, particularly if you own/rent a huge empty field in the middle of nowhere. You start with one X-90, but after a few months you need a new headlight bulb. Instead of buying new bulb, it is cheaper just to buy another entire car, so you now have two. But the new car needs a headlight and its dash is cracked, so you head back to craigslist...do you see where this is going? This guy's fleet consists of 3 with auto, 3 with 5-speed manual, half with working AC, and at least one that has been lifted. Were they playing Polo with these things? Not for nothing, Drew, but you might be right. Sad to say, but if you think the cars are stupid and ugly, wait until you see who owns them. The problem with this sale is that the seller shot him/herself in the foot by listing all of them together. The claims of rarity are diminished by the sheer quantity available. But on the other hand, what's harder to find, six separate X-90 buyers or one X-90 buyer who lacks self control and thinks, "maybe I could use another (five)"?